The Hounds of the Baskerville (sic) was founded by Charles Vincent Emerson Starrett in 1943. Starrett (1886-1974) was born in Toronto but moved to Chicago in 1896, made it his home, and began his writing career as a newspaper journalist for the Chicago Inter-Ocean in 1906. After only a year, he moved to the Chicago Daily News where he covered the crime scene and was also a feature writer, political analyst, and war correspondent. 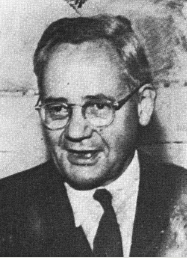 Starrett’s assignments during this time brought him into contact with other reporters including Eugene Field, Carl Sandberg, Jack London, Ben Hecht, and others who would hone their writing skills and, like Starrett, become prominent authors. In addition to his newspaper work, Starrett wrote and edited more than 50 books that include essays, criticism, fiction, biography, poetry, and bibliography. But he was most recognizable to the general public through his “Books Alive” column in the Chicago Tribune, a feature of the newspaper for more than 25 years until Starrett retired in 1967. Starrett’s adventure into Sherlock Holmes began during a trip back to Toronto at an early age. While visiting his grandfather’s bookstore, he found a volume of short stories that contained Arthur Conan Doyle’s Sherlock Holmes tale “The Adventure of the Speckled Band.” After reading it, he became a dedicated Sherlockian for the rest of his life and even got the chance to interview Conan Doyle in 1912. According to Mangler (2001), Starrett wanted to talk about Sherlock Holmes and Doyle wanted to talk about Spiritualism. They compromised – half and half. The fire and passion that developed in Toronto began to blaze in Chicago with Starrett’s The Adventure of the Unique Hamlet (1920), his first Holmesian book and a Sherlock Holmes pastiche. This publication gave him national recognition and brought Starrett into contact with other like-minded souls during the period before Sherlockians became organized into distinct literary circles. His 1933 book, The Private Life of Sherlock Holmes, is deemed a classic by Sherlockian scholars and his 1942 sonnet, 221B, is a literary staple of all Sherlockians. 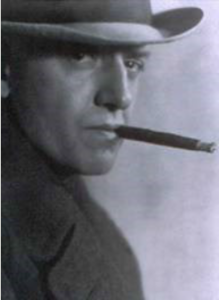 Starrett’s leadership role was instrumental in helping to forge the movement that led to the establishment of groups whose mission was to promote greater awareness of the Sherlock Holmes canon and expand the world of Conan Doyle’s, and literature’s, most famous character. Outside of Starrett’s Sherlockian interests and role in founding The Hounds of the Baskerville (sic), he can be seen as a remarkable 20th-century literary figure and, indeed, carried well his self-given moniker as “the last bookman.” Those seeking a more well-rounded biography of the man should look to Vincent Starrett – Chicago Man of Letters by former Master of the Hounds, Robert Mangler, at the end of this brief Hounds history or Starrett’s own autobiography, Born in a Bookshop (U. of Oklahoma Press, 1965). News of Starrett’s intent to form what would become The Hounds of the Baskerville (sic) goes back to 1942 and a notice in the November 22nd Chicago Tribune that “A Chicago chapter of the Baker Street Irregulars is planned by Vincent Starrett.” While Starrett was spearheading creation of such a group he did have support and help, most notably from his long-time friend and colleague at the Tribune, Charles Collins (1880-1964). 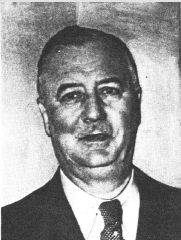 Collins, a fellow Sherlockian, edited the Tribune’s “Line 0’ Type or Two” column from 1938 to 1951 in which the Hounds were frequently mentioned after their establishment. John Nieminski, in his History of the Hounds (1983), refers to Starrett being “wangled by berth” to the Tribune by Collins, who actually may have motivated Starrett to organize the Hounds. With the two working in such close proximity, “it is probably no coincidence that the Hounds bonded onto the scene so soon thereafter.” There was also help and inspiration from Stanley Pargellis (1898-1968), Librarian for Chicago’s Newberry Library, and Horace J. Bridges (1880-1955), head of the Chicago Ethical Culture Society. On January 9, 1943, Collins reported further in his “Line 0’ Type or Two” column that he had visited Starrett the night of January 8th for the reason of “founding an esoteric circle, of which more anon.” True to his word, more was revealed about this meeting in his column on January 12th: Foregathered [on January 8] with three adepts in the recorded adventures of Sherlock Holmes, the great detective, for the purposes of founding an esoteric circle to study his cases, and perpetuate his fame, and observe his birthday with a feast. We have founded a chapter of the Baker Street Irregulars here in Chicago, the founding meeting occurred at my apartment on the evening of the 8th, while the annual BSI brawl was going on in New York. Suitable telegrams were exchanged between the celebrating groups. Morley’s to me, was refused by the Western Union as unnecessary and hilarious; I should like to have seen the original, which had to be cut down to an innocuous greeting. There is a division of opinion among the Chicago Irregulars as to the name for our group. Are we the Red Circle (political connotations here are unfortunate), the Red-Headed League, the Dancing Men, the Tired Captains, or the Hounds of the Baskerville (no S), Altamont Chapter, or Wisteria Lodge? What do you think? Or have you a better name than any of these? The Chicago chapter of the Baker Street Irregulars was founded in January 1943, without a name and with only four charter members. The four, who still greet one another with a shocking gesture of cut-throat affection, were Vincent Starrett, an obscure man of letters specializing in the Watson formula; Charles Collins, columnist of the Chicago Daily Tribune; Stanley Pargellis, librarian of the Newberry Library; and Horace J. Bridges, head of the Chicago Ethical Culture Society. Its present name, the Hounds of the Baskerville (sic), is a happy permutation later suggested by Dr. Pargellis, after fourteen earlier suggestions had been voted down. The group has had only one officer from the beginning, Mr. Starrett, who is known as The Needle. Most of the actual work of the organization, however, is done by Mr. Collins, whose daily column is a sort of clearinghouse for Sherlockian notes and queries, including all vital information about the exploits of the local chapter. Recently I formed a Chicago chapter, although not much activity has yet developed. There is a very active branch in Boston called the Speckled Band. My own feeling is that letting in just anybody who happens to think he likes Sherlock Holmes, or has seen Basil Rathbone in the motion-pictures, is a mistake. 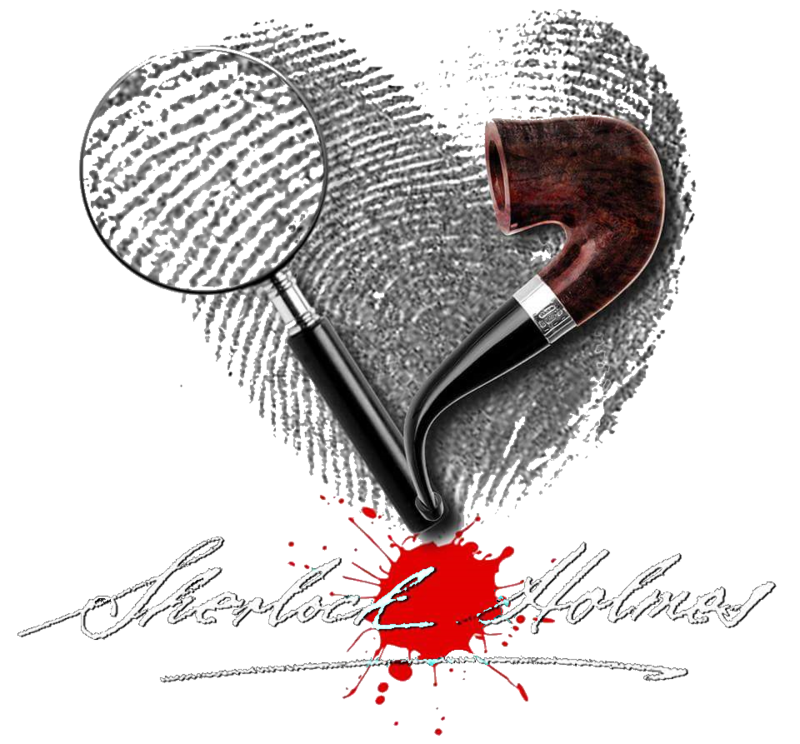 You will get more fun out of it if you will bring together a small group of genuine enthusiasts, any and all of whom are at least capable of contributing something to Sherlockian scholarship – whether or not they actually do. That way your discussions, anyway, will be intelligent and stimulating. Don’t meet too often. The Bostonians, who are fairly mad, try to meet once a month; but the NY outfit meets once a year for a big dinner – unless a few of the members care to get together now and then for luncheon and talk; but that’s their own lookout. 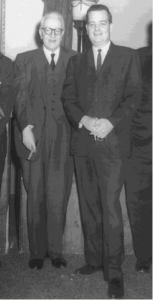 In fact, Starrett played a prominent role in the formation of the Baker Street Irregulars, and his stature among the New York group was such that he received their very first Investiture in 1944 as “A Study in Scarlet,” noting Starrett’s “devotion, affection, and scholarship over the years in unparalleled measure and beyond the call of duty.” The friendship between the two notwithstanding, Starrett attended only the BSI’s first annual dinner (December 7, 1934), and Morley never did make it to Chicago for a Baskerville carousal. The date of this first official meeting was January 7, 1944, and it was held at Schlogl’s Restaurant at Madison and Wells Streets in Chicago’s Loop – a famous haunt of newspaper journalist circles during the mid-twentieth century. Starrett noted in a memoir published in the Baker Street Journal in 1944 that the Hounds numbered an even dozen enthusiasts in attendance, among them W.H. Galliene, British Consul-General in Chicago; Dr. Irving S. Cutter, syndicated physician; Leonarde Keeler, inventor of the “lie detector”, Lowell D. Ryan of the FBI; Lt. Corn; Carl S. Brick, USNR; and Ben Abramson, bookseller. 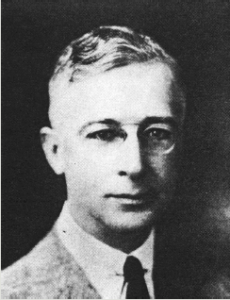 By January 1945 the Baskervilles had increased their number threefold and had developed a good deal of Sherlockian punch, particularly in the form of Jay Finley Christ, Professor of Business Law at the University of Chicago, and described as “one of the most scholarly of Starrett’s band of Holmesian acolytes.” (Nieminski, 1983) Like the Baker Street Irregulars, membership in the Hounds has always been by invitation only, although the group originally had its annual meetings in January, it changed the date in 1946 to late September or early October noting that it was the season of Michaelmas when the case of The Hound of the Baskervilles was brought to the attention of Sherlock Holmes. While Vincent Starrett remained the dean and doyen of all things Sherlockian, and founder of the Hounds, under his baton Mangler became the first officially anointed Master of the Hounds in 1964, a position he would keep for forty years. 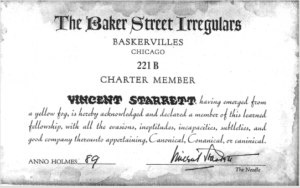 In 1964, Mangler also received his Investiture from the Baker Street Irregulars as “Sir Hugo Baskerville.” In fact, Mangler not only rose to the upper ranks of the Sherlockian world, but he would see his legal opportunities prosper, and for 27 years he held the position of Corporation Counsel for the Village of Wilmette, a suburb of Chicago’s North Shore. He also served as president of the International Municipal Lawyers Association for several years. 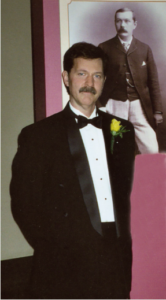 Don Terras had been introduced to the Chicago Sherlockian world in 1984 by Ely Liebow, a colleague at Northeastern Illinois University and nationally known Holmesian authority. Terras made his way up through the officer ranks to serve as president of Hugo’s Companions and of the Criterion Bar Association, another Chicago Sherlockian scion. He was The Companion’s Sir Hugo while presiding over their 50th anniversary festivities and, at the same time, project manager and contributing editor of Hugo’s Companions: The First 50 years of a Sherlockian Scion Society (Windy City Press, 1999). 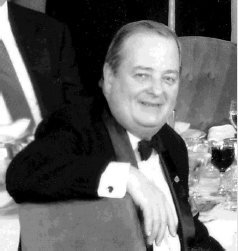 In 2003, he helped plan and served as chairman and Master of Ceremonies for “A Doyle Family Dinner” at Chicago’s Newberry Library, celebrating the establishment of the Newberry’s C. Frederick Kittle Collection of Doyleana. To help commemorate this event, Terras, at the same time Senior Lecturer of Anthropology at Northeastern Illinois University, arranged for the school to publish a limited-edition book, Sir Arthur Conan Doyle and Sherlock Holmes (NEIU Press, 2003). And so, at the Hounds dinner on October 7, 2005, Terras was welcomed as successor to Mangler as Master of the Hounds. At the same meeting, he was also inducted into the ranks of the BSI. Recognizing that Terras’ work includes management of a unit of local government while residing in a lighthouse, he was given the Investiture of The Politician, the Lighthouse, and the Trained Cormorant, the title of an intriguing unpublished account mentioned in the Holmes canon. To the present day The Hounds enjoy a respected patriarchal status in the Sherlockian world, which includes well over 300 recognized scion societies in the U.S. and over 400 worldwide. The Hounds anchor Sherlockian activities in Chicago, the foundation from which many other local scion societies have sprung, making the Windy City one of the most active centers for the appreciation and study of the Sherlock Holmes canon and written work of Sir Arthur Conan Doyle.